And so on this day of enormous change...hopefully! I did not vote today.... in person...since I did vote via mail-in ballot weeks ago! Moving on... as I hope we all will! Today I had another podiatrist appointment due to something I found when examining my right heel that had an insect bite on it, most likely when I drove my ride off the path onto the grass on Harborwalk. You see, this was Saturday after the health fair that Hubby drove over to Gilchrist Park via our car/van with Aussie while I drove "my ride" with Bella (Princess) on my lap. We were to meet at the pavilion to eat our shared multigrain Boars Head turkey and provolone lotsa veggies subs sandwiches from Publix grocery, and we eventually did. Although, my journey at top speed of six miles an hour took me a bit longer and since it was a Saturday many people were out and about. The solid pathways were abundant with joggers, bicyclers, parents and two legged little ones, as well as four-legged ones on foot and in carriages/strollers, groups of families and my ride is rather wide, and so a few times I drove onto the grass to allow them to pass en masse. 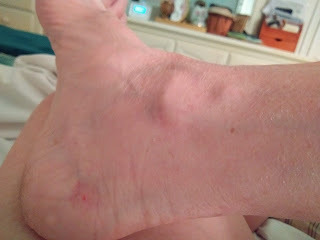 So when we arrived home I looked and I found the bite on my heel, which made me also find a hard lump coming from my inner ankle bone, attached to it actually! Thus the podiatrist appointment today, I had called just yesterday! Below is what I found, scary! Since that bump there above my inner ankle when Googled was said to be a tumor most likely cancerous due to it being hard, not soft would be a cyst. Well... today I saw the podiatrist and he said it is a varicose vein, warm moist heat and aspirin for the fix! He agreed that it was hard not a soft protuberance. I like Dr. Mark Tracey, but if this grows or does some other not good trick, he may lose me! The medical articles from the NIH and Mayo Clinic etc. other legit specialists in the field said these lumps are often misdiagnosed and end up unnecessarily as amputations! Hope not! Whew! While waiting in his waiting room and before we left most of today I have been fighting an exacerbation of my Multiple Sclerosis or an accumulation of a reaction to the Gabapentin that I have been on for the last few weeks! I have been having too many instances of dropping things even more so than usual! Magazines, cups, plastic thank goodness! Bella, but on the bed thankfully! Bumpity bump bump under my skin, not just my hands, but from my head to my toes!Woozy in walking, feeling like drunk! But had not a drop!Eyesight blurring more than usual. Not good! And just when I think I am better I get up and it starts all over again! So I called my neurologist and they wanted me to come in, but on the day Hubby is having his eye surgery, so now I will be going in this coming Monday, I guess they are open on Veterans Day! Taken Saturday 11-3-18, see the bite on the heel and the lump above the normal inner ankle bone? I cleaned that insect bite with peroxide and used antibiotic cream on it. Oh well... so I did write something! Hope you all voted today or before! Our power to change things in being counted by our voting! Count your blessings and we will too!